This article contains facts and information about the life and times of the famous Native American Indian chief known as Dull Knife. Who was Dull Knife and why was this Native Indian chief famous? Summary: Dull Knife, aka Morning Star, was one of the leaders in Red Cloud's War and led the Cheyenne tribe in one of the main attacks against Captain Fetterman, December 21, 1866. Dull Knife was also an ally of Sitting Bull, both of these leaders opposed reservations. Dull Knife also participated in the victory over General George Custer in the Battle of Little Bighorn on June 25, 1876. The following fact sheet contains interesting facts, background history and information about the life of Dull Knife and the events in history that led to his fame as a great Native American Indian leader. Dull Knife is one of those warriors who from a young age already displayed attributes of being a hero. Dull Knife was born around 1810 near the Rosebud River around what is now Montana, and as a kid, he already showed three characteristics which are highly revered among the Native Americans of that time – courage, unselfishness, and more importantly intelligence, especially in battle. Dull Knife showed these characteristics as early as nine years old. In one of their trips with the tribe, his family got separated from the entire tribe when they were hunting for buffalos. While he and his sister were playing along the river while their father was busy hunting and their mother was bus with something else a herd of buffalos came rushing towards them. Their parents immediately climbed a tree while Dull Knife led his sister towards a beaver cave and kept both of them safe until the buffalos passed. Their parents found them after. He was also responsible for taking care of the entire tribe when all of them were starving because of winter. He sought help from nearby regions and came back to the tribe carrying on his back loads of buffalo meat. That was not the end of his exploits however. In one of the skirmishes that their tribe went up against, he took a horse and charged towards the spot where his brother-in-law laid on the ground wounded. His image inspired most of their companions that they covered him while he carried his brother in law, but the protection was not enough as Dull Knife was wounded twice at the leg. These early exploits to helped him to prepare for the biggest battles of his life. Dull Knife favored peace until Chivington's massacre of Black Kettle's Cheyenne at Sand Creek in 1864. Early on, his band of Native Indians were successful will little skirmishes that they fought against the United States troops. In one of those was the ambush on Captain W.J. Fetterman where it started with a little diversion, which led to an ambush when Fetterman and his group of 80 troops on December 21, 1866. One of the chiefs in the ambush was Dull Knife. A year after they fought the Shoshone, the Battle at Little Bighorn on June 25, 1876 was waged by Red Cloud and one of the leaders in the battles that ensued was Dull Knife, and his main opponent during that battle was General George A. Custer and alongside his companion – Little Wolf – were able to defeat the General. On November 25, 1876 his camp on Powder River was attacked by Colonel Ronald McKenzie. Dull Knife had no choice but to fight, hoping that it would just be enough to delay the soldiers giving his people enough time to escape. However, starvation, casualties, and his genuine concern for the women, children, and elderly of his tribe forced him to surrender at Fort Robinson at Nebraska. As a result, the Cheyenne were forced into the Indian reservation. His people however were not happy or at least satisfied with their situation saying that if ever they would die, they would do so in their homeland. This placed Dull Knife in a personal conflict especially after the peace that they are already experiencing, but he obliged, because he knew that it is also what he wanted. Dull Knife led his people in a 1,500 mile long journey back to their homeland, where his people wanted to live. This happened in 1878. Just over a year after he surrendered, but the retreat did not come easy and it was not as successful as they hoped it would. Along their way towards their ancestral land, they met battles with American forces at Turkey Springs, in Indian Territory, Bluff Creek, Sand Creek, and Punished Women’s Fork in Kansas. They surrendered once more after just over a month of trying and were imprisoned at Fort Robinson, but escaped once more. For ten days they lived in terrible conditions before, on January 9, 1879, they stumbled upon Pine Ridge Agency which was at South Dakota. Many months later the Northern Cheyenne were given a reservation in Montana. 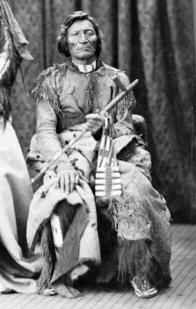 Towards the end of his life, Dull Knife lived in South Montana, which was near his birth place. He was in the company of his son, Bull Hump. He died in 1883 and his remains was re-interred in Lame Deer, Montana. For additional facts and information refer to the legend and the Story of Dull Knife. Dull Knife, (aka Morning Star). Discover the vast selection of pictures on the subject of the tribes of Famous Native Americans such as Dull Knife. The pictures show the clothing, War Paint, weapons and decorations of various Native Indian tribes, such as the Cheyenne tribe of Dull Knife, that can be used as a really useful educational resource for kids and children of all ages studying famous Native Americans such as Dull Knife. We hope you enjoy watching the video - just click and play - a great educational resource for kids.